If Trump were truly being FAITHFUL to his campaign promise he would keep "all" of that promise. Trump said, "I WILL PROUDLY SHUT DOWN THE GOVERNMENT OVER MY BORDER WALL"
Look at it this way. 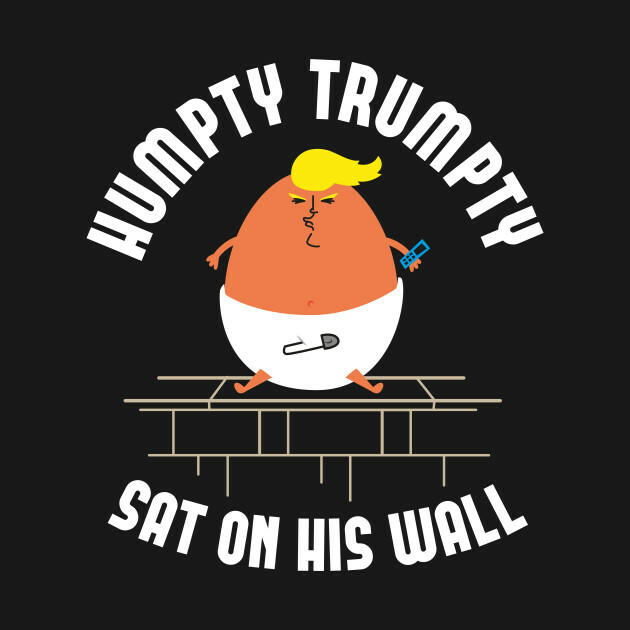 Trump is catering to his moronic base ............. a minority of Americans ignorant enough to believe that a Wall is the answer to border security and immigration reform. If you know "no one" that believes that then you need to broaden the scope of who you know. The majority of Americans don't want the wall. That's reality. Yep, it takes ignorance to believe that the wall is the answer to border security and immigration reform when it isn't. NO one has apposed "border security", the wall just isn't necessary to have that. Who do you know that this describes - "a minority of Americans ignorant enough to believe that a Wall is the answer to border security and immigration reform"? I know no one. Goes to shw we don't need trump's wall. It goes to show that there is no "one size fits all" solution - a total package is needed, including physical barriers. And, as to the quote - who has ever said that? Why is Trump opposed to real, effective border security? Is it for partisan purposes? Or is it for personal reasons? Since they had the votes in December to pass the bills why wouldn’t the Republicans bring them up for a vote? As McConnell said, he was not going to consider any bill that Trump wouldn’t sign. Nothing to do with Pelosi or the Democrats, just Trump and his Republican enablers. McConnell will not go against trump because trump placed McConnell's wife and brother-in-law in appointments. McConnell is bought and paid for, he's gott' go in 2020. Yes, so you have said. Alternate scenario - McConnell is supporting the campaign promises of the President who is of his Party. I know, I know - not nearly as exciting as your back door conspiracy theory. But, we are talking politics. Not "alternate scenario" but 'alternate reality",.You denying that trump appointed McConnell's wife and brother-in-law? McConnell owes trump for appointing his wife and brother-in-law. Wise purchase on trump's part, he bought the Senate Leader. That reality thingy gets y'a every time. Why do you consider it not possible for McConnell to support the campaign promises that got his President elected? They had the votes to pass the bill Pelosi wanted. I hope that answers your question. It was totally bi-partisan - Trump wanted, Pelosi refused. You are still wrong. They passed bills that were agreed to by the majority of both Democrats and Republicans. Trump whined that FOX was mean to him and he would not sign what he had agreed to earlier. Are the Republicans so incompetent that a little disagreement turns them into whiney babies? Trump has proven that is true for him, but do you put all Republicans into the same category? Your attempts to blame Pelosi for the failures of Trump and the Republicans is becoming ridiculous. The bill you refer to did not have the President's requirement for border security. How many different ways are you going to dodge that? Really? A minority of Americans voted for Trump. Many of them think a wall is top of the line technology. I mean, they keep asking "who could get over, under, or around a good solid wall?" Then they mention how their chihuahua has not managed to overcome their backyard fence in the last 3 years. I only know the CBP offices in New Mexico put out a notice not to bring in any more ladders from the walls which exist because they were running out of storage room between the garages for them. There was actually some discussion of having a sale but somebody pointed out the optics of having one show up at a barrier after being purchased from CBP. Try to avoid the nonsensical gibberish as above and try to point out who has ever said, "a Wall is the answer to border security and immigration reform" as you claim exists.